Supreme Court nominee Samuel Alito, who expressed strong opposition to abortion rights two decades ago, pledged Friday that his personal views on the subject "would not be a factor" in his rulings, the chairman of the Senate Judiciary Committee said. Sen. Arlen Specter, R-Pa., said Alito had told him in a private meeting that "with respect to his personal views on a woman's right to choose ... that is not a matter to be considered in the deliberation on a constitutional issue of a woman's right to choose. The judicial role is entirely different." As a young government lawyer opposed to abortion rights, Alito argued for a legal strategy of chipping away at the landmark Supreme Court ruling rather than mounting an all-out assault likely to inflict a defeat on the Reagan administration, according to documents released Wednesday. "No one seriously believes that the court is about to overrule Roe v. Wade," the current Supreme Court nominee wrote in an internal Justice Department memo on May 30, 1985. Referring to a high court decision to review two abortion-related cases at the time, he asked, "What can be made of this opportunity to advance the goals of bringing about the eventual overruling ... and in the meantime, of mitigating its effects." The memo was among several hundred pages of documents dating from Alito's 1981-1987 tenure in the Justice Department, released on the day the Supreme Court heard arguments in an abortion case for the first time in five years. CBS News legal analyst Andrew Cohen says the memo is "a rare and invaluable look at how one future candidate for the court disagreed with Supreme Court precedent and how he schemed either to get around that precedent or convince the court to do away with it altogether. "It certainly won't derail the Alito nomination but it won't make it easier, either," said Cohen. The argument before the justices Wednesday concerned the validity of a New Hampshire law that requires a parent to be told before a daughter ends her pregnancy — roughly the type of case that Alito was writing about two decades ago when he urged the administration to seek small victories in its legal battle against abortion. While no ruling in the current case is expected for months, the case will provide the first indication of Chief Justice John Roberts' views on abortion cases, and possibly a last word from Justice Sandra Day O'Connor. She has been the swing vote in the past on rulings that upheld abortion rights, and Alito's nomination as her replacement has raised the stakes for his confirmation battle. Even if Alito was confirmed and there was a vote regarding Roe v. Wade, the Supreme Court would still be one vote short of the necessary five to overturn the landmark ruling, reports CBS News analyst Jan Crawford Greenburg. "But it does appear this newly constituted court would be more willing to allow regulations and limitations on the abortion right," she said. Apart from the release of Reagan-era records from the National Archives, the White House Wednesday made public Alito's answers to a questionnaire from the Senate Judiciary Committee. The panel plans confirmation hearings beginning Jan. 9, and majority Republicans hope for a final vote on his nomination on Jan. 20. 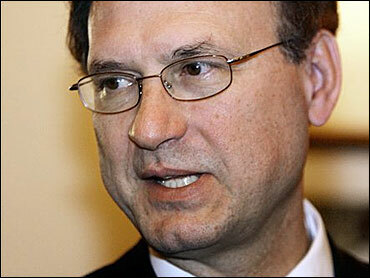 Asked to provide his views on judicial activism, Alito, 55 and a veteran of 15 years on the 3rd U.S. Circuit Court of Appeals, wrote that the courts "must engage in a constant process of self-discipline to ensure that they respect the limits of their authority." Judges must "have faith that the cause of justice in the long run is best served if they scrupulously heed the limits of their role rather than transgressing those limits in an effort to achieve a desired result in a particular case," he added. Alito's 1985 memo on abortion was a blend of personal belief, anger at previous high court rulings and cold-eyed political and legal judgment. On Wednesday it brought a renewal of Democratic doubts over his fitness for the court. "The significant concerns raised by these documents only magnify the need for Judge Alito to explain whether he still holds the extreme views in his 1985 job application," said Sen. Edward M. Kennedy, D-Mass., on Wednesday. "He needs to make clear that he no longer questions constitutionally established remedies for discrimination and protections for the right to vote, and that he will not come to the court with an agenda to roll back women's rights." Alito wrote his 1985 memo at a time the Supreme Court had agreed to hear appeals on two state laws restricting abortion rights. The justices "may be signaling an inclination to cut back," he said in the memo to the solicitor general. He recommended the Justice Department weigh in on the new cases by making it clear it opposed the 1973 abortion ruling. At the same time, he argued that his approach was "free of the disadvantages that would accompany a major effort to overturn Roe. When the court hands down its decision and Roe is not overruled, the decision will not be portrayed as a stinging rebuke." The memo was contained in Justice Department records that had been turned over to the Archives in 1999 by the Clinton administration, according to White House spokesman Steve Schmidt. The administration refused to permit the release of similar documents during Roberts' confirmation, and Schmidt said "the rest of Alito's internal solicitor general's documents are still privileged and will not be released."